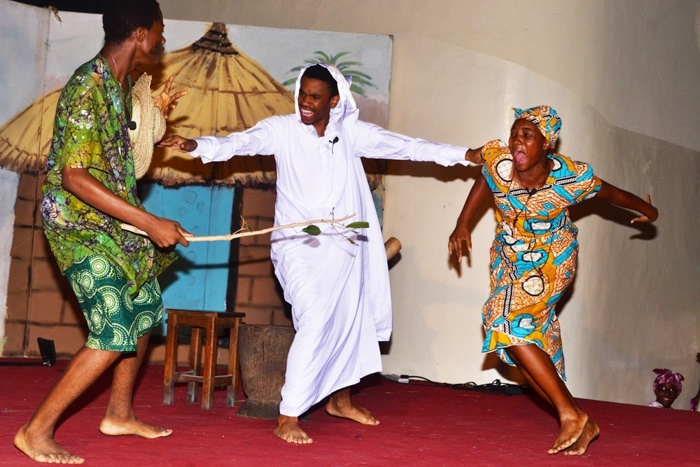 IN THE SHORT PLAY, Grip Am, Ise, wallowing in abject poverty, in an effort to protect his only treasure in life (his orange tree) from his troublesome neighborhood children and landlord and deal with his belligerent wife, contrived a trick that ended up preserving his life. His wisdom also helped him to beat death, avoid paying his rent, settle his squabbles with his wife and attain the peace that was lacking in his marriage. “Grip Am,” a Pidgin English parlance, means “Catch it!” “Hold it!” “Stop it!” It can also mean “Hold onto it!” “Grip Am” is an order for us to stop those behaviors that lead to the abuse of power, enmity, petulance, confusion, corruption, sorrow, destruction, and death. In contrast, “Grip Am” also urges us to hold onto the habits that promote peace, courage, love, joy, unity, humility and freedom. Perhaps, the most poignant message in the play is about the use of power and the abuse of power, the abuse of absolute power. What would you do with the power that has been given to you? If you were given the power to determine the fate of others, how would you use it? Would you us it to destroy others or to improve the lives of others? Would you use it for selfish or for selfless motives? Misuse of power can bring crisis, enmity, corruption, destruction, and death. With wisdom, love, and courage we can make proper us of the power and talents that have been bestowed on us. Therefore, let us “grip” and hold onto the message of wisdom, love, and courage as we celebrate our Sixty Angels who epitomized these virtues.